During the day of action against DSEI in 2013, activists blocked access at both entrances to the arms fair. The DSEI arms fair is where arms companies showcase their weapons and make deadly deals with buyers from across the world, including those from countries with serious human rights problems. The arms fair, due to take place on 15-18 September, involves more than 1000 companies and 30,000 attendees. We have to stop these companies profiting from conflict and repression. Join us from 7 September for a week of action in the run up to the arms fair to make it as difficult as possible for it to go ahead. Each day different groups will be organising actions highlighting the different impacts of the arms trade and repression. Exhibition equipment and military hardware will be rolling (or sailing) into ExCeL – let’s stop it getting to its destination. Thursday 10 September: Welfare not Warfare! Saturday 12 September: Big day of action! 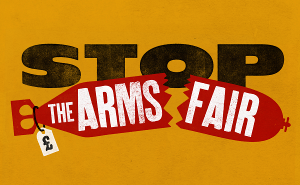 On Saturday 12 September there will be a big day of action on the weekend before the arms fair begins to stop the arms dealers going about their deadly business. Join the Facebook event and invite others too! See the full list of actions taking place. Practical information: See our practical information page for travel advice, legal support and the drop-in space at the Garden Community Cafe. The Excel Centre is on the Dockland Light Railway (known as the DLR), which connects to the London underground (and you can use your oyster card, just as with all other transport systems in London). You will probably want to join the DLR either at Bank station (which connects with Central and Northern line) or at Stratford station, which connects with Central and with London overground). (handy hint: if you get on the DLR at Stratford, there are lots of different platforms: you need platform 17). An alternative way to go is to take the Jubilee line all the way to Canning Town, and join the DLR there. Whichever of the above routes you take, you will need to travel on the DLR line to Prince Regent station (final destination will be marked as: Beckton). According to the Centers for Disease Control and Prevention, In 2013 firearms (excluding BB and pellet guns) caused 84,258 nonfatal injuries (26.65 per 100,000 U.S. citizens) and 33,636 deaths (10.6 per 100,000). There are 319 million people in the U.S., which means about 1 out of every 2,705 people in the U.S. was shot by a firearm in 2013; about 1 out of every 9,484 people in the U.S. was killed by a firearm in 2013. Extrapolating over a typical lifetime of 74 years and assuming the above trends continue, 1 out of 37 people currently alive in the U.S. will be shot by a firearm during their lifetime; 1 out of every 128 people in the U.S. will be killed by a firearm during their lifetime, most well before they reach 74 years of age (about 1 out 192 will commit suicide with a gun, while 1 out of 384 will be shot to death by somebody else with a gun. This is an appeal for solidarity with the Musical Protest at ExCeL London on Saturday 12th September 2015. Whatever you are doing at 2.30pm that day, wherever you are, Please will you sing ” Down by the Dockland’s side ………We aint gonna export war no more”? It fits the tune Down by the Riverside. We need love not war. When will we ever learn, when will we ever learn?